Uglyworld #260 - What Happens When An Uglydoll Borrows Your Camera, originally uploaded by www.bazpics.com. 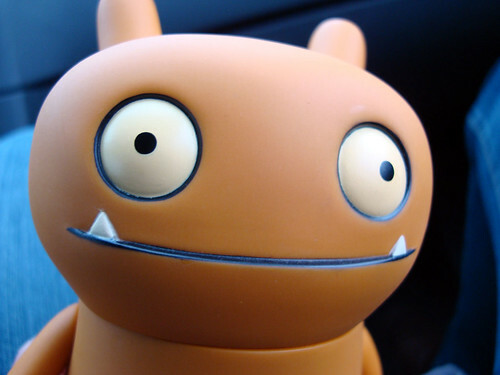 Have you ever wondered to yourself what happens when you decide to let an Uglydoll borrow your camera for the day? Almost 16Gb of photographs which contain various parts of Wage's anatomy and random objects from here, there and everywhere. Don't get me wrong, they're funny (Wage still laughs whenever I ask him about the pics he took) but having to sort through almost 1000 images to find stuff that is keepable (or usable) is quite a hard task and one that Wage has kindly deligated to me. I particularly like this one which he said he shot while a security guard was forcibly removing him from the female changing rooms in one of the local department stores in Aachen. Wage is completely mad (but great fun too).